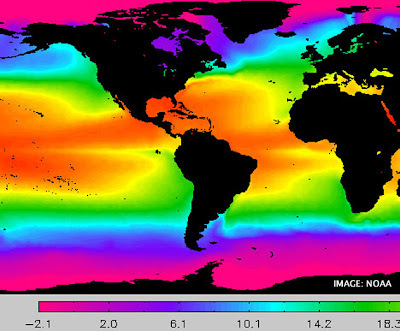 An image of hyper colored Earth showing warmer than usual ocean temperatures. NOAA is reporting that Ocean temps are the highest they've been in a long time. It seems that we are in fact warming up and ecosystems will change and adapt with our help, or vanish without it. If you want to help out by tracking Global Climate change you can participate and help further the study of Phenology. The USA National Phenology Network brings together citizen scientists, government agencies, non-profit groups, educators and students of all ages to monitor the impacts of climate change on plants and animals in the United States. Go to their site and learn how to track seasonal change if you've got a little extra time and like to look at flowers and contain some basic Botany knowledge. Also go to Project Bud Burst for the version geared towards young students and the education community. These projects are engaging and yet require little effort. We could all be a part of a large collective of citizen and professional scientists who track climate change and its effects on the flora and fauna of our planet. They're looking for people who can identify certain plants and monitor them on a weekly basis. So if you live somewhere near any vegetation, home or outside, you can participate. It takes a little time but could be a worthy endeavor knowing that we will have to learn how to adapt to climate change very soon, and we had better get started now.